deliver a safe and high-quality service. provide competitively priced services to our customers. ensure excellent customer experiences and thereby repeat business. ensure that a ‘customer for life’ policy exists. be an integral part of the economic development of Montserrat. 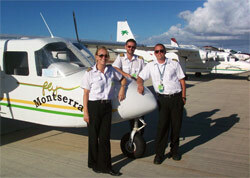 FlyMontserrat only employs pilots approved by the United Kingdom Civil Aviation Authority [ASSI]. We follow all the training requirements of ASSI which are comprehensive. Following initial training all pilots are required to carry out Line training with our Chief Pilot. Pilots are checked every six months as to their continued competence. For Instrument flight our requirement is for the flight to have two qualified pilots or an autopilot. Maintenance is currently provided by a ASSI approve maintenance company on Anguilla, which is certified to UK standards. It is intended that FlyMontserrat will have their own facilities on Montserrat shortly. Nigel has been a home owner on Montserrat since 1989 and has been the Chairman of the Board and Managing Director of MA Ltd since it began operations in 2009. 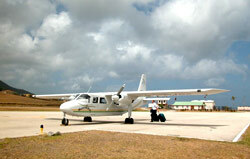 Previously Nigel owned and managed Montserrat Airways Limited, based at Bramble during the period 1990 to 1996 with two Islander Aircraft. Forming his own Airline in the UK in 1983, he has operated piston and turbo prop aircraft on both scheduled and on-demand services , including a franchise for Air France. With over 15,000 flying hours under his belt, and 30 years Airline management experience Nigel is well qualified for the position. Welsh joined the Company’s Board of Directors in January 2013. He is a Montserrat-born aviation professional, who has worked for more than 25 years in the development and certification of Avionics and Electronic Flight Controls technologies for Business and Transport Category aircraft. He has been actively involved in the Aerospace industries in the USA, Canada, Europe, Brazil and China, developing next generation aircraft. Welsh has now joined the management team in Montserrat full time.